Written by: Priya Potapragada on July 16, 2015. In an effort to create equal opportunities for disabled people in Africa, the African Union declared the first decade (1999-2009) of the new millennium as the African Decade for Persons with Disabilities. This initiative led to the creation of the Africa Disability Alliance (ADA) in 2004 to establish an avenue for the disabled community in Africa to have a voice in policymaking. The ADA’s advocacy efforts have allowed them to work extensively with a broad range of organizations serving people with disabilities such as the Pan African Alliance for People with Albinism. In East Africa, people with Albinism have been victims of kidnapping and murder simply because of the lack of color in their skin. In 2015 alone, eight women and children were abducted and killed for their body parts for profit. According to local superstitions, albinos, those born without pigment in their hair, eyes and skin are thought to be cursed ghosts, sorcerers or demons who bring good luck to those who turn them over to “traditional healers,” otherwise known as witchdoctors. To prevent further assaults, state police arrested unlicensed traditional healers and witchdoctors across the country and in 2014 made crimes against albinos punishable by death. To continue to combat violence against Albino community, ADA strongly advocates for the empowerment of the disabled with sustainable methods to improve their education system, skills and living standards. 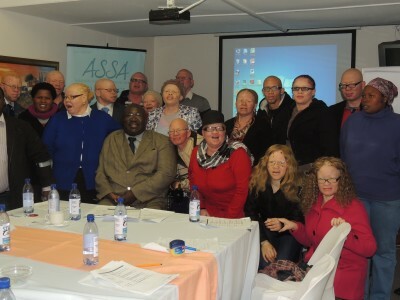 The ADA supports groups like the Pan African Alliance for People with Albinism by providing funding, organization tools and strategic planning resources to enable the organization and its members to self-represent their needs. To promote their efforts, the ADA organizes sensitization workshops on issues related to disability for African Union governments and civil society organizations. The workshops facilitate conversation and awareness about the hardships disabled people endure every day. Africa Disability Alliance has also promoted collaboration between governments and civil society organizations which has resulted in the successful development of the protocol to the African Charter on Human and Peoples’ Rights on the Rights of Persons with Disabilities in Africa. The collaboration also enabled the development of disability, mainstreaming plans and budgets in different countries as well as the implementation of the Southern Africa Development Community, an inclusive education strategy for learners with disabilities. Organize sensitization workshops on issues related to disability and development. “With timely support, persons with disabilities can create islands of excellence within societies that are immersed in wars, poverty and underdevelopment. The principles of equality, non-discrimination, and respect for human rights as outlined in the UN Convention on the Rights of Persons with Disabilities are good not only for persons with disabilities but for mankind as a whole,” said Africa Disability Alliance CEO, Kudakwashe Dube. The Africa Disability Alliance is headquartered in Cape Town, South Africa, and has regional offices in Dakar, Senegal and Addis Ababa, Ethiopia. For more information, visit: Africa Disability Alliance.